Mahesh Babu's upcoming movie 'AAGADU' with director Sreenu Vytla and production 14 Reels Entertainment is going to get infront of fans on 8th December,2013.As 'DOOKUDU', the previous movie of Mahesh Babu and Sreenu Vytla combination has set up in many viewers as a BLOCK BUSTER, 'Aagadu' is being excepted more than Dookudu.The movie will be embellished with Thaman's music and so the songs would surely make a super hit.Hoping everything would be fine and are eagaerly waiting for this action-romance movie.Let's wish good luck to 'Aagadu'. Here is the first look teaser of NTR’s Ramayya Vastavaiya in the direction of Harish Shankar. Samantha and Shruti Hassan are doing female lead. Shooting of the film is currently going on. Dil Raju who has delivered Brindavanam hit with NTR in the past is producing this movie. Thaman SS composes music. Chota K Naidu handles cinematography. Brahma Kadali is the art director. This film is going to release on August 9th. The teaser of South Indian Actor Mahesh Babu's new film was released on Friday, on the eve of actor Krishna's birthday. Mahesh Babu's upcoming film titled, 'One-Nenokkadine' is directed by Sukumar of "100% love" fame.The director choose "One" as the title of the film through several names, including "Acharya" and "Columbs" were doing the rounds. The teaser of the film was released on May 31st in a bid to coincide with Krishna's birthday.It may be recalled that the first look poster of Mahesh's films "Seethama Vakitlo Seethama Chettu" and "Dookudu" were also released on the eve of Krishna's birthday. The 32-second "One-Nenokkadine" teaser has received massive response, attracting over two lakhs viewers in just a day.The official teaser has 276,040 hits at the time of filling this story.The video looks promising with Mahesh Babu seen in a rockstar avatar.Two first look posters of the film were also released simultaneously with the teaser. "One-Nenokkadine" is said to be a psychological thriller. Mahesh would be seen sporting a toned body for the first time.He has been undergoing training with world renowned trainer-Kris Gethin for the role. The film being is produced by Ram Achanta, GopiChand Achanta and Anil Sunkara under the 14 Reels Entertainment banner, "One-Nenokkadine" has model Kriti Sanon in the female lead and music composed by Devi Sri Prasad. The industry is buzzing about the news regarding Mahesh Babu's upcoming film trailer and poster of One Nenokkadine.The title and posters are released on the occassion of Superstar Krishna's birthday. The trailer and poster of Mahesh Babu's upcoming movie One Nenokkadine is released on May 31st,Friday on the occassion of his father Super Star Krishna Birthday.The new Mahesh Babu movie is written and directed by Sukumar.The director has titled Mahesh Babu's new film as "One", with a tag line "Nenokkadine". The movie is directed by Sukumar and music is composed by Devi Sri Prasad.The movie will be released under the prestigious banner 14 Reels.Sukumar, who is famous for his unique styling and characterization of his film's Heros, has portrayed Mahesh Babu in "One Nenokkadine" in new look. The first look of Mahesh Babu's previous films like Seethama Vakitlo Serimalle Chettu and Dookudu have also been released on his father's birthday.Directed by Sukumar, "One Nenokkadine", which also features Kriti Shanon, Sayaji Shinde, Kelly Dorji, Vikram Singh and Sinivasa Reddy is nearing completion. vote for ur fav hero..! April 11th, 2013 is a grat day for Prince Mahesh Babu. Being awarded for the third time, Mahesh was totally excited for his "NANDI AWARD".He had worked hard for DOOKUDU and successed in his work.And lets say 'WOW!' 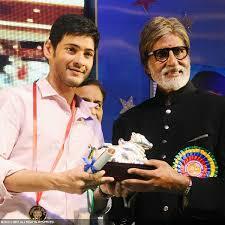 for being awarded by Mr.Amitabh Bachan. Dookudu has got 7 Nandi Awards.What a success!? Hope he goes with successful movies for a long time. Mahesh has got three Nandi Awards for the films Dookudu,Athadu and Nijam.